Vinyl Digital Exclusive: Limited Edition of 300 golden colored Copies! Shag made something special and created a cool new twist to an already nostalgic composition of music. This compilation of Zelda tunes defined the childhood of the young producer and he spent countless hours surrounding himself in the game and it's music. 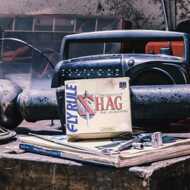 Check out the great homage and vinyl debut by Shag! Oh my Gah! This is some amazing record, good sound quality and while music is subjective, if you enjoyed playing that sweet Ocarina in Ocarina of Time, you sure wíll love this! It's hiphop beats with zelda influences! Damn! The color of the vinyl just happens to be the same golden color as the old NES and N64 cartridges of the Zelda series, I found that to be a nice touch. I'd recommend buying this if you love Zelda OoT and beats. The album is top quality and I would recommend it to anyone looking for chill and/or video game based music. The gold colored vinyl is also very nice looking and the outer jacket is also decent looking.